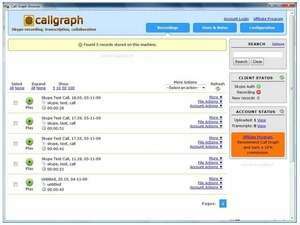 Call Graph is a phone recording tool designed especially for use with Skype for windows. This free software will either manually or automatically record phone calls. After you've installed Call Graph, you should select a destination folder for where recorded calls should be saved. You can then configure Call Graph to automatically or manually record a Skye call; Automatic recording is selected by default but we recommend disabling it both for privacy and for legal reasons. Version 1.3.0.0 is a freeware program which does not have restrictions and it's free so it doesn't cost anything. For security reasons, you should also check out the Call Graph download at LO4D.com which includes virus and malware tests. Additional screenshots of this application download may be available, too.